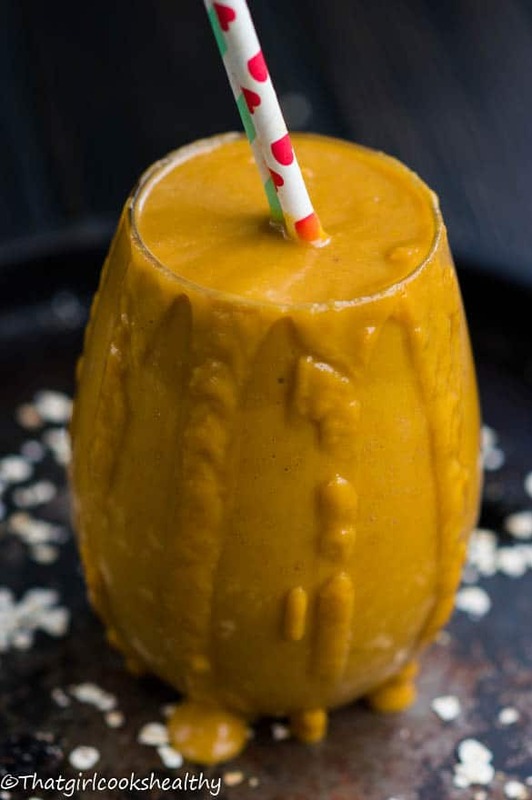 Sweet potato pie smoothie – this dairy free sweet potato smoothie is full of anti inflammatory properties, high in vitamin c and fibre. I think this beverage might be my favourite of all time, and to think I haven’t even explored all there is in the land of smoothies. I’m partial to sweet potatoes also known as yams to my state side readers, in the UK we don’t refer to sweet potato as yams. Yam at least in the Caribbean community is a tuber root vegetable and form part of what’s known as the ground provisions. More often than not when I’m browsing the internet looking for some inspiration I have to distinguish between true yam and sweet potatoes, don’t worry I’m used to it now. Now that I’ve done my infamous sweet-potato-and-yams-are-not-the-same-thing-in-the-Caribbean-discussion let’s focus on the recipe at hand. Here I present to you the big daddy of all things sweet potato, this is the big brother to the scrumptious sweet potato pie dessert. If I had my own way I would simultaneously eat the pie and guzzle down this smoothie with no regrets. If you’re a fan of sweet potato pie then this beverage is just for you, I know many people have a love/hate relationship with them, some despise their naturally sweetness, while others are simply disappointed that the taste and texture is not parity to a regular white potato. 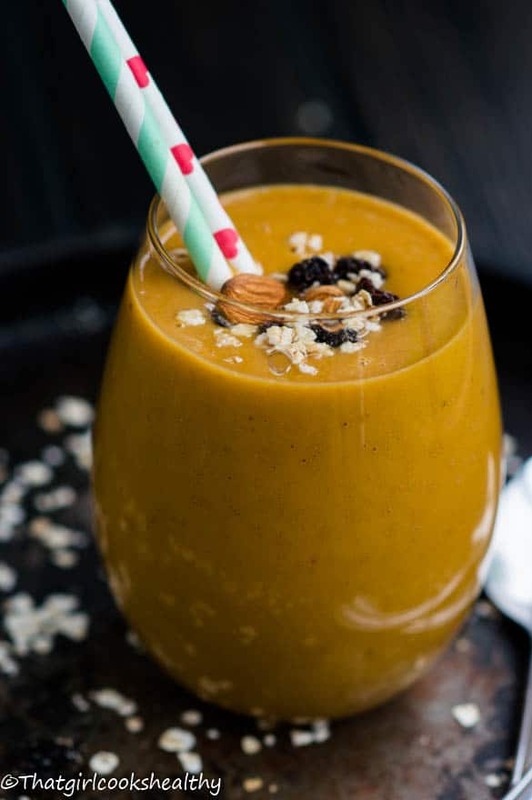 In order to make this smoothie you will need to cook the sweet potato first at all. It cannot be made with a raw potato, but the potato won’t take very long to cook through. Nevertheless it’s safe to say there’s at least someone out there who will be jumping for joy and raving about this smoothie. What can I say it’s super duper filling thanks to the boiled sweet potato combined with the full fat coconut milk – all homemade, you know I don’t do the store brought stuff (I’ll spare you the additives rant). Moreover, it’s loaded with warming spices. I would render this beverage as very timely with the summer season coming to an end. 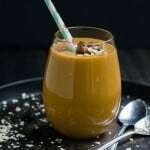 It’s a smoothie with warm notes, which helps to ease you into that transition from summer to the fall time – now you won’t feel so crestfallen about leaving the salads, popsicles and smoothies behind. 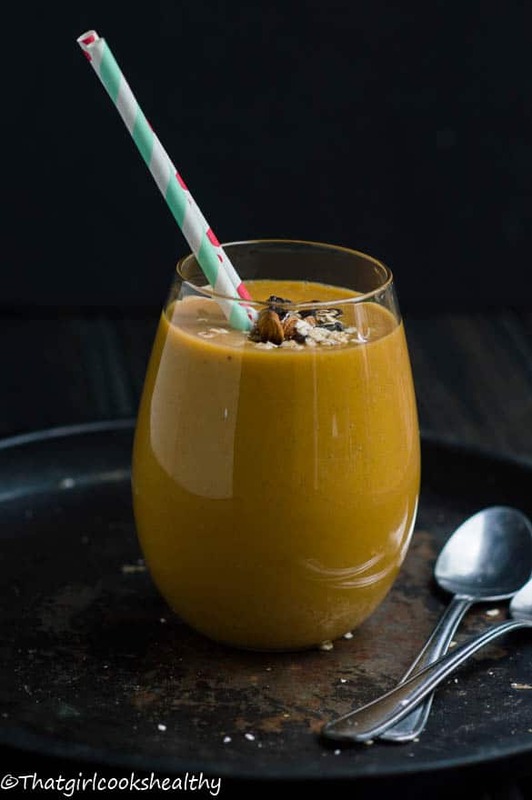 Suitable for a meal replacement or simply incorporate into your pre-existing healthy lifestyle, there’s nothing but vitamins and minerals in this drink that will nourish the body. 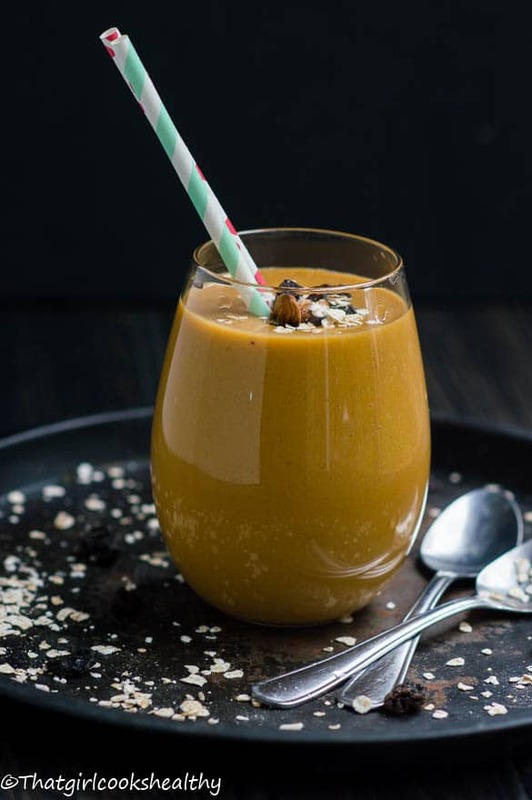 Great for breakfast as I said drink it in the form of a meal or on the side – if you’re vegan, paleo or gluten free then hey I’ve just catered for your needs – thank me later! Add all of the ingredients to a blender and blitz on high speed until a smooth consistency is formed. I just stumbled upon this recipe on Yumgoggle and pinned it so I can try it later. I love sweet potatoes and have yet to meet anyone who doesn’t like them. This looks so good and I can’t wait to try it. Thank you. I always drink this when I need something filling and tasty to gulp down. I was told to eat more sweet potatoes so I am starting with this one! Thanks for sharing with Saucy Saturdays! Great transformation of an old favourite by many. Sounds great but what else can you use if you don’t have ginger. Cocoanut milk nutmeg dates. Can substitute sweetener and apple juice be used instead. I wanted to make your recipe but didn’t have all the ingredients. Hi Carol, thank you so much for reaching out to me. 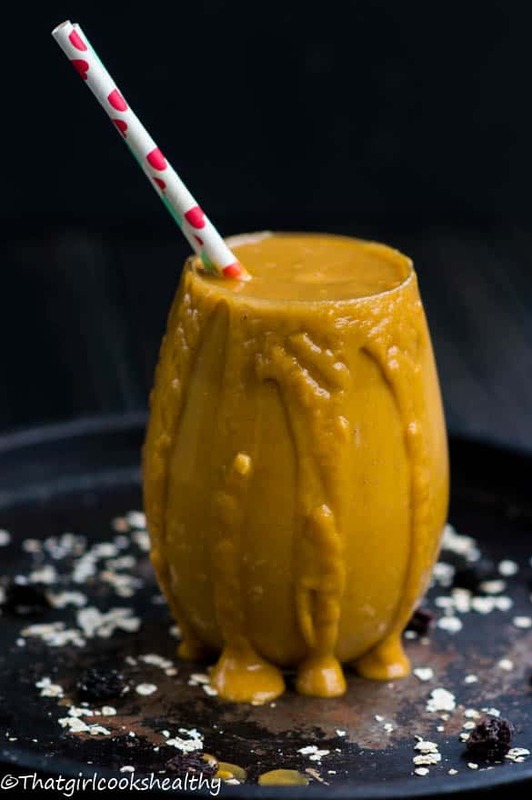 You can certainly substitute a few of the ingredients to a certain extent, for instance you can use any type of dairy free milk such as cashew, almond rather than coconut milk. Also you don’t have to include dates although they do offer a caramelised taste, you can use any low glycemic index sweetener. Unfortunately the nutmeg and ginger cannot be replaced, they are required for the correct warmth and deep of flavour. If you can struggling to source them locally, try Amazon, they stock almost everything on there. I wouldn’t recommend apple juice as this will change the recipe entirely. I hope that helps, if you’re still stuck, please message me again and I will be happy to work with you to tailor this recipe to your satisfaction. of boiling it? How many times a week would you recommend one enjoying this libation? Thanks! Hi Ceil. Yes you may roast the sweet potatoes. I can imagine that the flavour would deepen from doing the roasting method. As sweet potatoes are quite dense in complex carbs you may not want to consume them on a daily basis. I personally think this smoothie is quite filling and could easily be a healthy energy boosting meal replacement. Also, unless you’re on a low carbohydrate diet then consuming it on a daily basis is just fine. You’re welcome. It’s an ideal meal replacement. Hi Victoria, that’s not daft, good observation? Serving tends to be subjective which is why I tend to shy away from stating it. 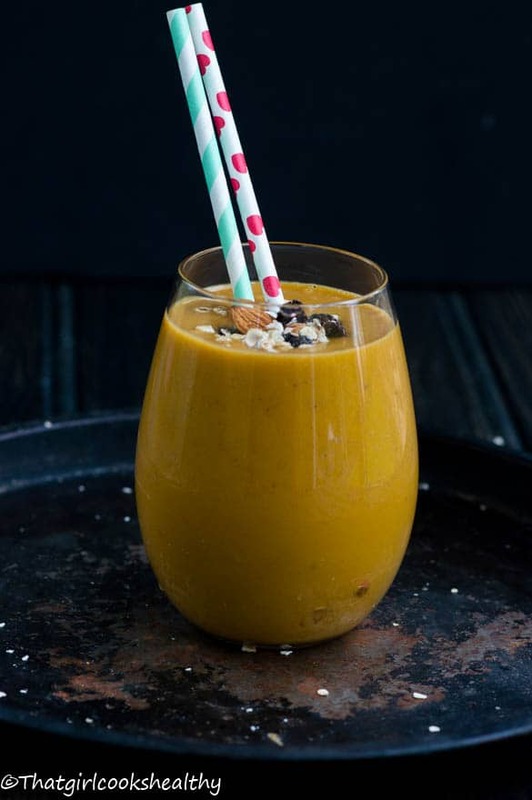 However this smoothie easily serves two people, very filling too might I add! I hope you make it and love it! Awesome! so glad you enjoyed it Victoria.